This wheelchair cushion that combines the superb skin protection and shape matching ability of ROHO DRY FLOATATION with the stability of Jay® base technology. This cushion design allows for improved pelvic alignment and stability for improved position and function while maintaining optimal immersion and envelopment of both the ischial tuberosities and greater trochanters. The ROHO shape fitting cushion provides critical pressure redistribution around the pelvis area providing you with superior skin protection that ROHO is known for. Lightweight: Varies by size; approximately 3.5 lbs/ 1.5 kg (based on 17.75” × 18.75” size). Stability: The contoured foam base is engineered specifically for ROHO, providing improved positioning of the pelvis and lower extremities and enhancing sitting posture. This added stability assists the individual in achieving safer transfers in and out of their wheelchair. ROHO Hybrid Elite has an optional Heavy Duty cover available to order separately or as an upgrade from the standard RHE cover when ordering a RHE. are at a moderate to high risk for skin breakdown. require pelvic and lower extremity positionin. have difficulty with lower extremity positioning and alignment. 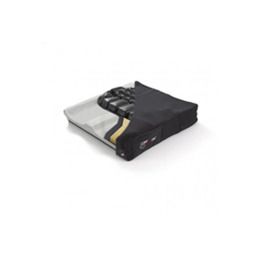 The Hybrid Elite Single Compartment Cushion must be used with the supplied cover.